"Catarina de Bragança (1638-1705)++Lucy Walter (c1630-1658)+Elizabeth Killegrew (1622-c1680)+Catherine Pegge (?-? )+Barbara Villiers, 1st Duchess of Cleveland (c1640-1709)+Eleanor Gwynne (1650-1687)+Mary Davis (c1648-1708)+Louise Renée de Penancoët de Kérouaille, Duchess of Portsmouth (1649-1734)" cannot be used as a page name in this wiki. 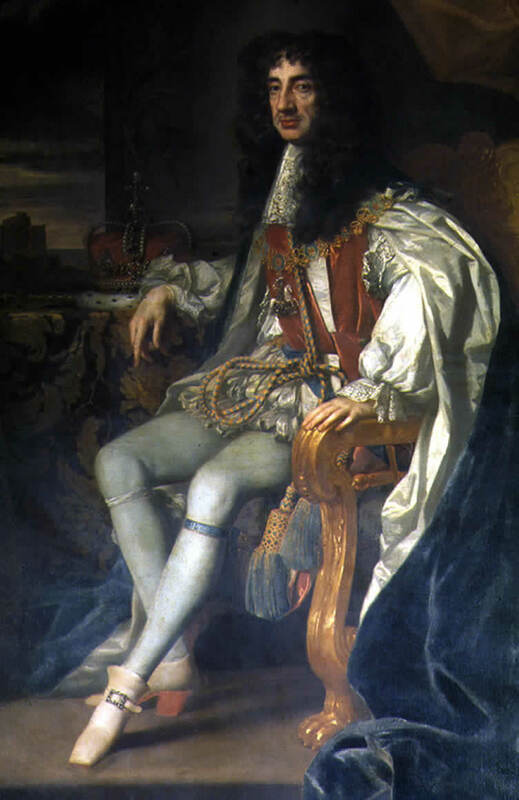 Charles II Stuart, King of England, King of Ireland, King of Scotland, was born 29 May 1630 in St.James's Palace, England, United Kingdom to Charles I of England (1600-1649) and Henrietta Marie de Bourbon (1609-1669) and died 6 February 1685 in Whitehall, England, United Kingdom of unspecified causes. He married Catarina de Bragança (1638-1705) 21 May 1662 in Portsmouth, Hampshire, England, United Kingdom. Notable ancestors include Charlemagne (747-814), William I of England (1027-1087), Hugh Capet (c940-996), Henry II of England (1133-1189), Alfred the Great (849-899), Robert I of Scotland (1274-1329). Ancestors are from the United Kingdom, France, Denmark, England, Germany, Belgium, Spain, Italy, Russia, Ukraine, Czechoslovakia, Hungary, Austria, Poland, Switzerland, Lithuania, the Netherlands, Portugal, Belarus, Bohemia, the Czech Republic, Slovakia, Slovenia, Israel, Ireland, Scotland, Turkey, the Byzantine Empire, Sweden.